Unfortunately a regression has arisen in v1.3.7. If the issue affects you, then v1.3.6 is working fine, until the issue is fixed. Yeah, I can confirm that the issue is no longer present in v1.3.6, so I will be using that one until it's fixed. Thanks for the advice. I found one more thing which doesn't work for me, not sure if it's a bug in the Library Tree or something in Foobar. When I use the | sign to add another group level inside an if condition, the code won't work. I know the conditions work for 1 level of grouping, so title formatting seems to be supported inside both the custom sort and view patterns of your Library Tree. Is there anything I need to change in order to make this work? Thanks a lot, much appreciated! @culinko. The issues raised should be fixed. ......... option for items counting. It will be great if numbers in brackets can show correspondingly the number of sub-folders (artists) in genre folders, the number of albums in artist folders and the number of songs in album folders. Would you now consider these option in the future, for those of us who collect mainly albums instead of singles. Thanks you kindly. WilB, your JS plugins are really great!! General question to your plugins (Library Tree, YTTM, Bio): is there a way to assign specific menu items, which are usually accessed by right mouse, to a button (eg most liked filters in the Library Tree)? If it requires specific coding, a small example would be great from where I could start create own buttons. ADD: Improved sorting of multi-value items sent to playlist. As before a custom sort can also be used. CHG: Node Item Count. Either sub-items counts or track counts (as before) can now be displayed. Set preference in panel properties. ADD: Menu item (shift + right click) to batch create m-TAGS. Runs m-TAGS creator. Follow instructions on menu item. See documentation for full info. @mojobass It's possible to create buttons in the script, by adding more onto the button_manger object. If you mean elsewhere then notify (search interfaces for notify) might be able to be used to communicate with another JScript panel containing the buttons, but I don't think it would work if the buttons were elsewhere. Thank you very much for this Info. I will look into it (but not too sure if I am able to do adaptions in the buttom_manager...). I really think it's more useful than track counts. I did not find where to increase font size. I use Ctrl + Alt + mouse wheel, but it's not very practical. I'd like something like SEGOE semibold 10. In Panel Properties put '_CUSTOM COLOURS/FONTS: USE' to 'True', then you can change the font at '_Custom.Font (Name, Size, Style [0-4])'. Thank you very much MojoBass. I was changing font without putting "True" to CUSTOM COLOURS/FONTS: USE' ! Search: ALL I WANT FOR, crash. But search: All i want for, not crash. Well you can't use uppercase ALL because it has a special meaning in queries that returns everything. If you use double quotes around it then it's fine. But the script should have the fb.GetQueryItems function inside a try/catch statement to prevent errors. If you use double quotes around it then it's fine. FIX: Regression related to query syntax help. FIX: Missing try/catch with one of the fb.GetQueryItems functions. This is fantastic. Thank you very much for your hard work with this component. Is it possible to set the cover of the currently playing track as a background of Library Tree ? I looked in settings but maybe I missed something. Is there a way to change the color of "Item Counts" (numbers in brackets) other than text? I think that then it would be clearer. What an amazing script, I'm loving it! Library tree is so far one of the best feature of foobar. I am trying to customise my settings to my needs however due to my luck of knowledge I need some help. @Tropoje & novaca. The requested features should be in the next release. @zoumbro. The aggregation methodology of the type you require isn't supported. The filter uses foobar2000 query syntax and AFAIK that doesn't support it either. Is it possible to have the views list as a view? or the PLT mod called Library Tree. ADD: Themes: dark, blend & light ("right click > menu > theme"). ADD: Option to set current cover as background ("right click > menu > theme"). Cover opacity & auto-fill can be set in panel properties ("Cover..."). ADD: Configurable root name. Choice of "All Music" or view name, e.g. "Artists", "All Genres" etc. Enable in panel properties "Node: Root..." and set view names as required. 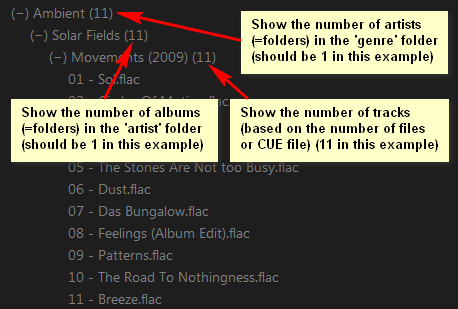 To show number of artists etc, set "Node: Item Counts" to show "Sub-Items" [panel properties]. ADD: "Tree: Remember State" [panel properties]. Remembers expanded nodes, search & selection state etc on closing / opening foobar2000. Default is enabled. ADD: "_Custom.Colour Item Counts" [panel properties]. FIX: Compatibility with JScript Panel v2.0.1.